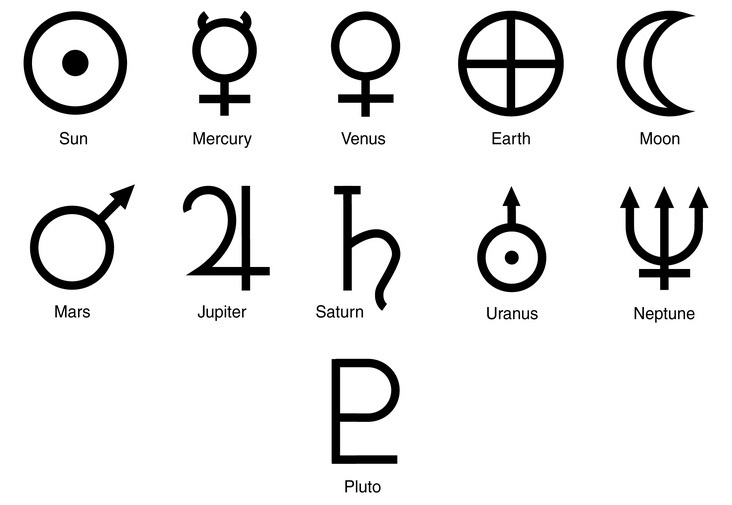 The astronomical symbols for the most significant entities in our solar system. Astronomical symbols are symbols that are used to represent celestial bodies such as the Sun, Moon, planets and other objects in the sky. The very earliest forms of astronomical symbols were created in ancient Greece and additional symbols were created in the 18th to 19th centuries when more planets were discovered in our solar system. 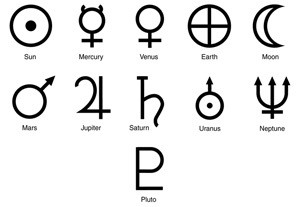 These different codes or symbols were commonly used by astrologers and astronomers both professional and amateur for many years but in recent times astronomical symbols are used less and they tend to feature more in astronomical books and research now. Let’s find out more about some of the more common astronomical symbols. The Sun – This symbol is represented by a shield with a circle inside. It is believed by some that the central spot in the symbol represents a sun spot. The Moon – The astronomical symbol for the Moon is a crescent. This is a popular symbol in astronomy that you may have seen before. Mercury – The symbol for Mercury shows the head and winged cap of Mercury the Roman god of communication and commerce with his staff. Venus – Venus is represented by a symbol that looks like a hand mirror. This is because it is used to represent the Roman goddess of love, Venus and the symbol is commonly used as a general symbol for “female”. Earth – The symbol for the Earth is a sphere or globe which has lines representing latitude and longitude. This basically cuts the globe into quarters. Mars – This symbol shows the shield and spear of the Roman god of war, Mars. It is the symbol that is also commonly used to mean “male”. Jupiter – The symbol for Jupiter is said to represent either hieroglyph of an eagle or the arm of Jupiter (or Zeus in Greek mythology) holding a lightning bolt or it represents the initial letter of Zeus with a line through it showing an abbreviation. Saturn – This astronomical symbol is meant to show a scythe or sickle which may have been used by the god of harvest. Uranus – This interesting symbol seems to be a combination of the symbol for the Sun and Mars. This is because in Greek mythology Uranus was believed to represent the sky, the heaven and the stars which are dominated by the light from the Sun and the power of Mars. Neptune – A trident is used to represent Neptune to reflect the Roman god of the sea. Pluto – This symbol is a monogram of the two letters P and L. These are the initials of the person that first uncovered the planet, Percival Lowell.